A weekend with this contractor-grade carpet cleaner, and suddenly you may not need to buy a new carpet after all ! 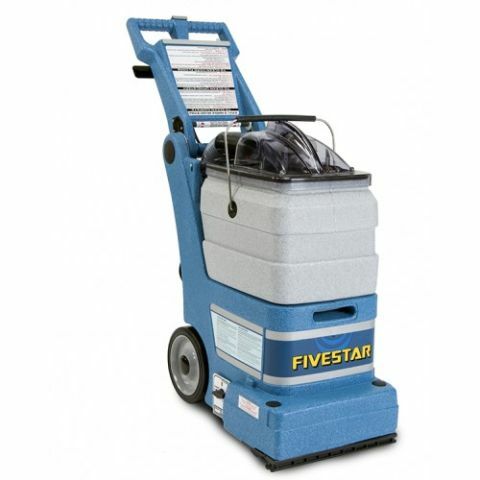 Whether you're dealing with of a water-damaged carpet or accumulated staining from foot traffic, a carpet cleaner rental, or carpet extractor rental, the technical term -- is among the most transformative pieces of rental equipment. Why? Because in one day, a carpet cleaner rental can make an entire room look new. And the same goes for ridding upholstery, hard floors and grouted tile of dirt, stains and grit. At 40 pounds, the carpet extractor is can be transported and moved around easily, and the brush and vacuum assembly self-adjust to various carpet lengths and floor patterns. This particular model has a very handy removable bucket, so you can fill and empty the three-gallon solution and recovery tanks away from the carpet.A fold-down handle translates to easy transport, and can be adjusted to different user heights. Brushes aggressively sweep the carpet at 2,500 rpm, and more than 90 percent of the solution pressured into the carpet in 12-inch swaths at 50 psi is recovered. Can I fit the carpet cleaner rental in my car? Yes, at 40 pounds and with adjustable handle, this unit will even fit into a compact car. DO: Pick a warm, dry day to clean your carpets -- the last thing you want is to have a carpet that looks clean but smells of mildew. Another trick is to turn up the air conditioner or heater in the house after you've finished. DO: Start working in the corner of the room furthest from the doorway, so you can avoid walking on carpet you've just cleaned. If you must walk on the clean carpet, wear clean white socks, or place plastic bags over your shoes. DO: Move all the furniture from the room(s) you'll be cleaning with the carpet cleaner rental. If you have to move the furniture back into the cleaned area before the carpet is fully dry, place aluminum foil or foam pads under the legs. Copyright 2017 by OpenRental. All Rights Reserved.